According to the Bureau of Labor Statistics, the unemployment rate for workers with a Bachelor’s degree averaged just 2.8% in 2015. That is much lower than the overall rate of 4.3% and it means that for most college grads finding a job should not be difficult. That’s not to say that college grads have it easy. Student loan debt is soaring (the average student now owes more than $35,000 at the time of graduation). Likewise, those low unemployment figures belie the reality of an economy in which college graduates too often have to settle for low-paying or part-time jobs. This is the 2016 version of SmartAsset’s study. Read the 2015 version here. For college students with the ability to relocate after graduation, choosing the right place to live can go a long way toward alleviating some of these problems. For instance, in a city with low housing costs and a strong employment market, a college graduate may have an easier time paying down that debt. That, in turn, can allow her to get an earlier start on financial priorities like buying a home or saving for retirement, good points to get help from a financial planner. Buying your first home? Compare mortgages and find a low rate here. O-H-I-O. The Buckeye State claims two of the top three cities for college grads, with Cincinnati ranking first and Columbus ranking third. These Ohio cities rate well across all three categories of metrics we considered: they are affordable and fun places to live, while still offering strong employment opportunities to new graduates. Unemployment down, cost of living up. In more than half of major American cities, college graduates face unemployment rates of less than 3.5%. On the other hand, the cost of living in many of these same cities is increasing. That can make it hard to pay off debt, even for grads with jobs. 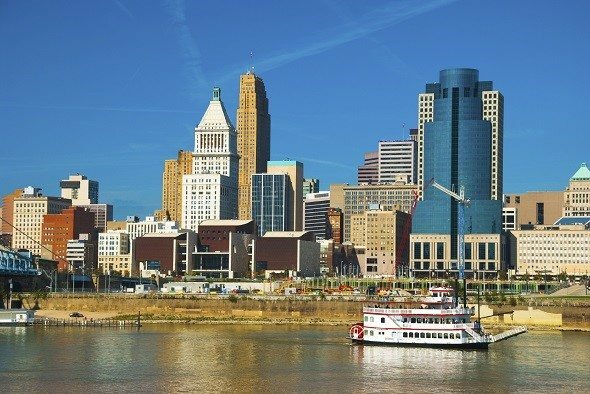 New college graduates looking for a city that is both affordable and fun but also offers good job opportunities may want to look to Cincinnati. The cost of living in Cincinnati rates as the third lowest among major U.S. cities, at 7% below the national average (which includes inexpensive rural areas). Median monthly rent as of 2014 was $538, and though market rents have increased some over the past year Cincinnati’s rental market remains far more affordable than many cities. Meanwhile, Cincinnati is a great place to live – especially if you’re young. Twenty-somethings account for 20% of the city’s population, fifteenth highest in the U.S. The city also has some of the country’s best breweries and brewpubs. Pittsburgh is home to a number of major colleges and university, including Carnegie Mellon, Duquesne and University of Pittsburgh. Those schools provide the city with a constant stream of new graduates. Twenty-somethings constitute 24% of Pittsburgh’s population, fourth highest among America’s largest cities. Nonetheless, Pittsburgh remains both affordable and a good place to find a job. The unemployment among bachelor’s degree holders is just 2.7% in the Pittsburgh area. Thanks to the city’s relatively low home prices, it also rates as one of the best places to buy a home for the first time. As the capital and largest city of Ohio, as well as the home of the state’s flagship university, Columbus has a number of built-in advantages that make it a good choice for college graduates. It has the 12th-highest concentration of 20-29 year-olds of any major U.S. city. With a cost of living 3% lower than the national average, it also rates as the eighth most affordable big city in the U.S. That’s especially important for new graduates with student loans to pay off. Columbus was the only city in SmartAsset’s study to score higher than a 65 (out of 100) on all three of the factors we considered (jobs, affordability and fun). Want to buy a home in Ohio? Find out what your mortgage payment will be. Kansas City is known for its barbecue, its world-champion baseball team and its burgeoning tech industry. Thanks to Google Fiber it has some of the fastest internet speeds in the country, ideal for cable-cutters who want to stream their favorite TV shows (Game of Thrones, for instance). It is also one of the most affordable cities in the U.S. 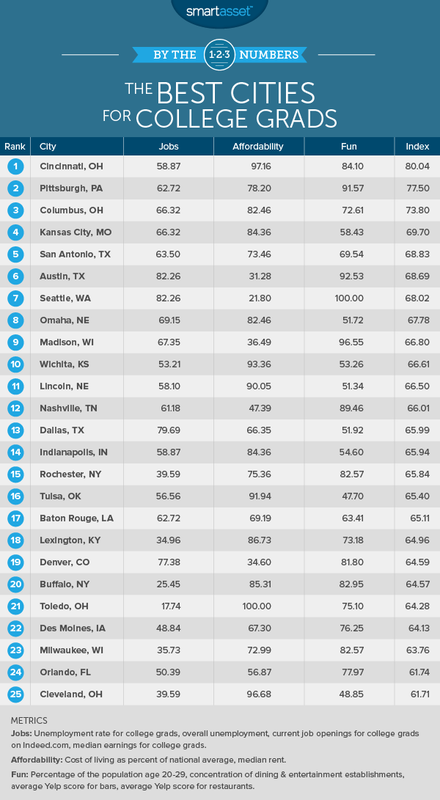 The overall cost of living is slightly below average in comparison to the entire country, but ranks as the 18th lowest among major U.S. cities (big cities tend to be more expensive than smaller cities and rural areas). For college graduates who dislike cold weather, the top four cities in our ranking may not be a good match. San Antonio, on the other hand, could be perfect. It addition to its warm climate, San Antonio offers a relatively low cost of living. It has the lowest cost of living among America’s 10 largest cities, and 21st lowest among the 107 largest cities in the county. Its economy is also strong, with an overall unemployment rate of 3.5% as of December 2015. After ranking first in our study last year, Austin slips to the sixth slot this year, largely because of the city’s rising cost of living. It scored a 55 on that metric last year but just a 31.3 this year after annual rent inflation of more than 7%, according to Census data. 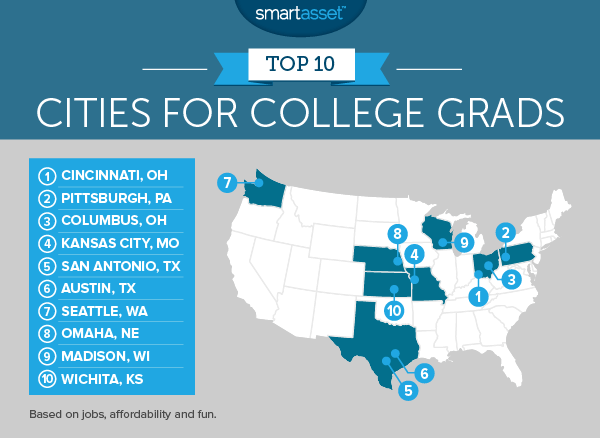 Nonetheless, it remains a great city for recent college graduates. Austin ranks as the fifth most fun city in our analysis, with some of the best restaurants, bars and coffee shops of any U.S. city. Its booming economy also promises plenty of great job opportunities for college grads. The overall unemployment rate in the city was just 3% as of December 2015, sixth lowest among major cities. Seattle scored a perfect 100 for “fun” in our analysis, thanks to its concentration of entertainment establishments (think: live music), the large population of twenty-somethings living in the city and the high quality of the city’s bars and restaurants. That doesn’t even include many of the factors that make SeaTown a truly great place to live, such as the several nearby national parks and forests. Seattle also has one of the strongest job markets in the country, with unemployment among bachelor’s degree holders at just 2.6% in the Seattle area during 2014, and likely even lower now. Those workers earn a median annual income of about $57,000 in Seattle, 12th highest in the nation. The one downside to keep in mind for college graduates who are considering a move to Seattle is the cost of living. Seattle scored just 21 out of 100 on that measure, thanks to rising rents and an overall cost of living that is 12% higher than average. The largest city in Nebraska, Omaha has one of the lowest unemployment rates in the country. For workers with a bachelor’s degree unemployment was just 2.3% in the Omaha area on average during 2014 (the most recent year for which education-specific unemployment data is available). That’s the eighth lowest rate of any major U.S. city. Overall unemployment was 3.0% as of December 2015, the sixth-lowest rate in the U.S.
As of December, 2015, the unemployment rate in the Madison area was just 2.9%, fifth lowest of any major U.S. city. There is even greater demand in Madison for workers with a bachelor’s degree, who face an unemployment rate of less than 2.5%. Madison is also a fun place for young people to live. It has the third-highest population proportion of twenty-somethings of any major U.S. city. It also features the seventh-highest concentration of bars, restaurants and entertainment establishments. Wichita rates as the fifth most affordable city in our study, scoring a 93.36 on that measure. The median rent paid by Wichita residents is just $548 per month. The city’s job market is also fairly strong for college graduates, who face an unemployment rate of just 2.6% in the Wichita area. That’s 19th lowest among the cities in SmartAsset’s study. For each of the 107 largest cities in the U.S., SmartAsset calculated three different 0-100 scores. The scores were based on metrics reflective of jobs, affordability and fun, as described below. Jobs. How strong is the employment market in this city? Metrics considered were the 2014 average unemployment rate for workers with a bachelor’s degree, the overall unemployment rate as of December 2015, the median income for workers with a bachelor’s degree and the number of job openings for college graduates on Indeed.com. Affordability. How much does it cost to live in this city? This score was based on two metrics: the overall cost of living as a percentage of the national average (including things like food, healthcare and transportation) and the median rent in the city. Fun. What is non-work life like for college graduates in this city? This score was based on the number of 20-29 year-olds as a percentage of the total population, the concentration of dining and entertainment establishments, as well as the average Yelp ratings for bars and restaurants in the city. We calculated those three separate scores for each city as follows. First, we ranked each city according to the metrics included in each score. Then, we averaged the rankings across each of the three categories. For each category, the city with the best average ranking scored a 100, while the city with the worst average ranking scored a zero. Finally, for each city we averaged those three scores. The best cities for new college grads were the ones that rated the best on average across the three categories. Data on unemployment for bachelor’s degree holders comes from the U.S. Census Bureau’s 2014 American Communities Survey, as does data on the median income for college graduates, the median rent and the percentage of the population age 20-29. Data on overall unemployment rates comes from the Bureau of Labor Statistics. Data on the cost of living comes from the M.I.T. Living Wage Calculator. Data on the concentration of dining and entertainment establishments comes from the U.S. Census Bureau’s Zip Code Business Patterns survey. Data on the number of Indeed.com job openings for college graduates was collected through the Indeed API, and is as of April 2016. Data on average Yelp scores for bars and restaurants was collected through the Yelp API.